Fixed missing link on "Teach - Teaching Help" page, and added around 40 new links to Pinboard. August 23, 2017: Added even more to "Teach - Teaching Ideas" page. May 22, 2017: Added more activities to "Teach - Teaching Ideas" page. January 24, 2017: New blog posts. August 30, 2016: Added 2 film discussion PPTs to "Teach - Teaching Ideas" page. May 17, 2016: Added "Ultimate Grammar Resource Guide" to "Learn - Learning Help" page. May 5, 2016: Jason Renshaw's reply to my comments on his article - added to 'Blog Articles & Posts' page. Response to article about online learning vs face-to-face added to 'Blog Articles & Posts' page. Under 'Teach - Teaching Ideas' added own infographic of the Order of Adjectives. Added 250 pins on Academic English and Classroom Management to 'Teaching - Ideas' page. Under 'Teaching - Ideas' added reading on Paris, swimming action song, and vocabulary on feelings, clothes, weather & using a compass. Welcome to Greg's English and Music Pages Home. This website is dedicated to students and teachers of English as a second or foreign language. Please explore, use freely what you find useful, share it with others and add your own contributions if you wish. Also, please bear with me while content is being added from time to time. In yet another major update, I am pleased to share solo and ensemble performances in which I played either harpsichord or chamber organ. There's also a few YouTube jazz tracks with my friend Mark on trumpet, and some personal ESL introductory presentations. Please click on the link above and enjoy almost three hours of music. Great news! I've finally published my first book, and you can read all about it by clicking on the "Blog Articles & Posts" link above. There are 29 chapters on both education and teaching English offering ideas, suggestions and thoughtful articles for every teacher, both new and old. "Principled Possibilities - Ideas for Teaching" is published by Lulu Press. You can go directly there using the link in the left column on this page, and navigate to a 12-page preview. There is a paperback version as well as an e-book (PDF) version which you can download and read on any device. The book is also now available at Amazon in both paperback and Kindle formats. You can visit my author page on Amazon and see the links to both editions here: http://www.amazon.com/author/gregqbear. I'm excited to announce a new page for teachers focusing on music and song in English language teaching. It's the outcome of a recent professional development session I was involved in, and it's represents the synthesis of my studies, researches and practical teaching experiences over a number of years. I hope the materials, approaches and suggestions will encourage more teachers to incorporate music in their teaching. Now you're here, what's next. LEARNERS - listen to music and stories, watch videos, read comics, books, practise spelling, play games, solve puzzles, use a dictionary, translate, chat with friends, share ideas and find useful links to other resources. Simply click on the "Learn" pages to see how. TEACHERS - find worksheets, activities, PowerPoint presentations, watch teaching videos, read articles, and find useful links to other resources. Simply click on the "Teach" pages link to see how. 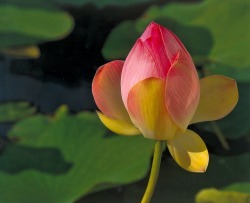 The lotus is one of Buddhism’s most significant symbols. It represents enlightenment and purity of the mind. It also symbolizes many aspects of the path to enlightenment. As the lotus grows out of the still water and mud of the pond (samsara – the cycle of rebirth), it leaves the mud (worldly existence) behind to emerge straight toward the sky, it appears clean on the surface (purity), and blossoms into a beautiful flower (enlightenment). The flower opens its petals to catch the warm sun's rays, reveals its beauty and purity, and shares its fragrance with the world.